Unleash a brilliantly dimensional smile. You love being in the know, discovering the latest and greatest beauty treatments for your skin and hair before anyone else does. But what about your smile? Turn it up to mega-watt with your newest beauty "must have," Crest® 3D White Luxe Whitestrips® Supreme FlexFit. Experience our whitest white, as well as $500 professional treatment*, but one that you use to whiten teeth at home. Important usage information: Keep out of reach of young children. Product is not intended for use in children under the age of 18. Do not swallow plastic strip. Tooth Sensitivity and Gum Discomfort: With all whitening products you may experience tooth sensitivity and / or gum discomfort. With products that provide a high level of whitening, such as Crest 3D White Whitestrips Luxe Supreme FlexFit, there is a greater chance that you may experience tooth sensitivity and / or gum discomfort. These effects are generally mild. These effects are temporary and not harmful. If you are in need of dental work, have dental work, or have staining from medication, ask your dentist if whitening is appropriate. 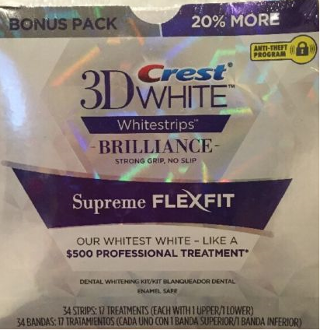 Crest 3D White Whitestrips Luxe Supreme FlexFit are designed to hold well to teeth. Do not use on loose teeth, restorations, or braces. Crest 3D White Whitestrips will only whiten natural teeth. The strips will not whiten caps, crowns, veneers, fillings or dentures.